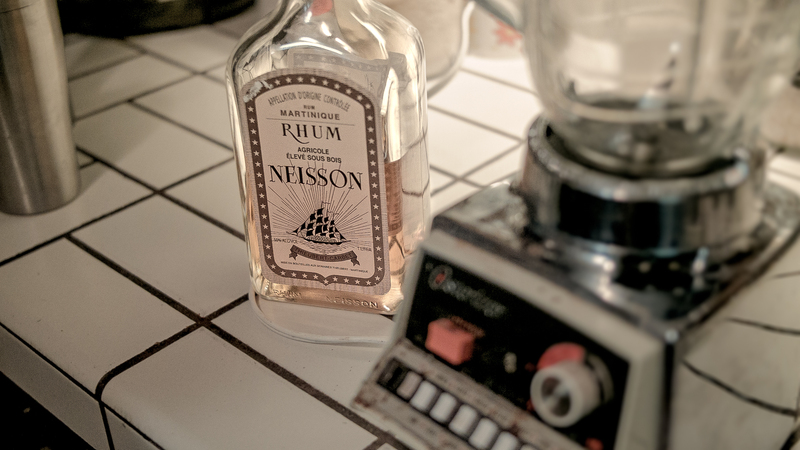 7) Lightbulb goes off – just add rhum! 10)Global peace as world leaders converge on the river and imbibe these heavenly beverages. Maybe I should go back to the invention of rum (early 1800s) or when Gunther’s opens (1940)…no, let’s press on. 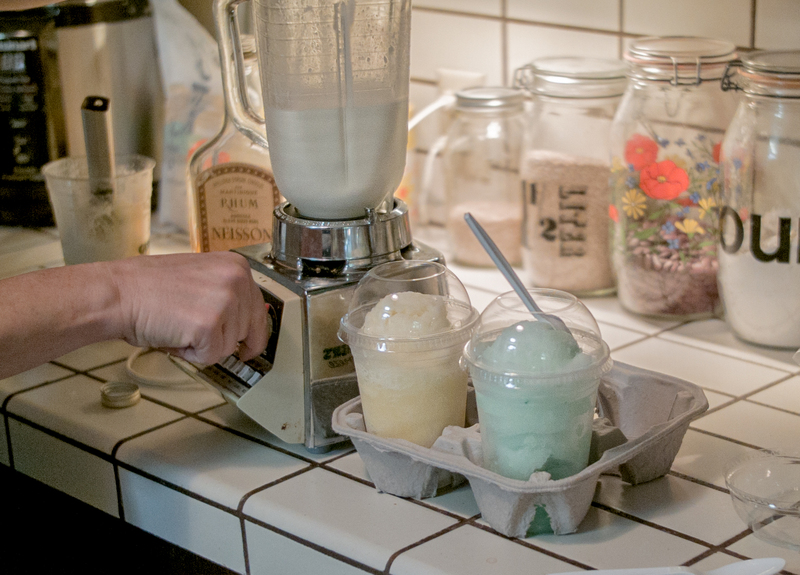 Just take some pineapple freeze, put it in a blender with some rum (at least a shot per drink, the intense sweetness means you can add more without it tasting boozy), mint, ice and you have the most refreshing thing ever. 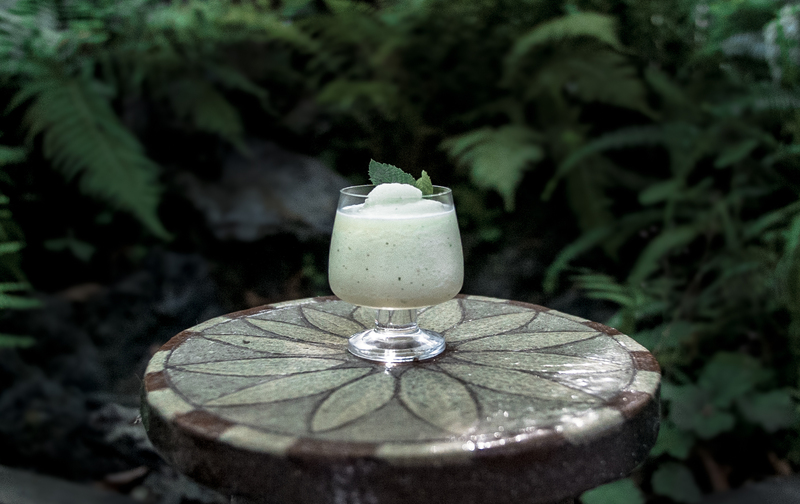 A variation on this drink, which is not quite as refreshing but much richer, can be made with pineapple freeze, coconut pineapple ice cream and rum. 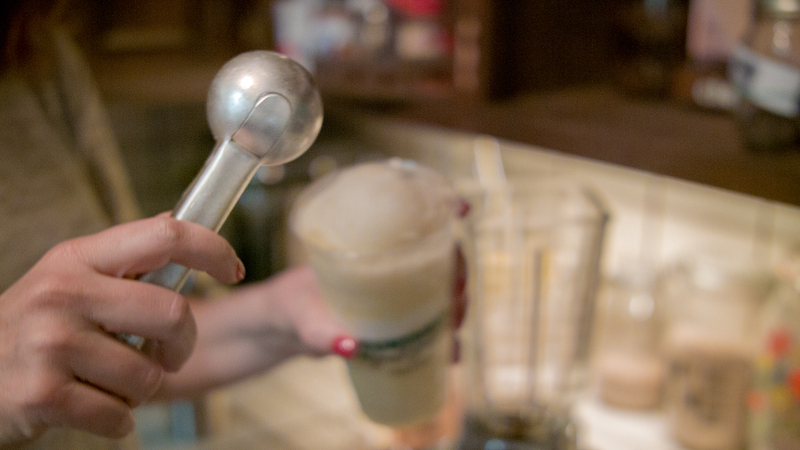 That one is called the 50/50/24/7/365 because you will want to be drinking it constantly. I know what you’re thinking, “Becky, you’re a genius but what is this Bongos On The River thing?” The photographer, Willy Busfield, and I invented a business to sell these drinks, and any other Gunther’s-based drinks we can think of. 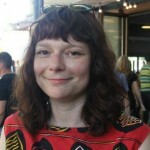 It will be called Bongos on the river and it will be staffed by tropical parrots and a chimp. The parrots will take your order and the chimp (dressed in a Hawaiian shirt, natch) will mix your drink. We will just wear white suits and Panama hats and play bongos, island style. Adam Pechal, contact me if you would like us to set up this business at Crawdad’s. We only need enough area for a small shack made of palm fronds and bamboo, and a large cage for the chimp when he is off work.